By now you have likely seen the results of a flurry of activity around the Fountain at The Circle over the past few weeks. 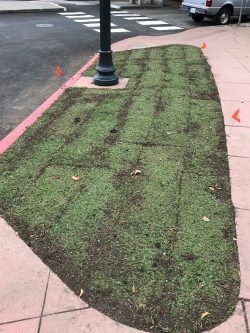 Most noticeable is the re-landscaping that has taken place, removing the old, weed-ridden sod on the fountain island, the planting strips surrounding The Circle and the median between Los Angeles and Mendocino with new ground covers that we hope will stay green and healthy the year-round. You will also notice that these areas are being regularly irrigated. New plantings like these are allowed to be watered while they are establishing themselves. 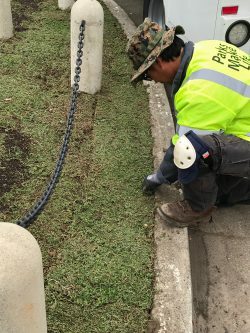 Once established, irrigation will return to whatever rules govern similar areas of city property. These improvements were made possible by city funds freed up by the passage of Measure WW by East Bay residents several years ago. 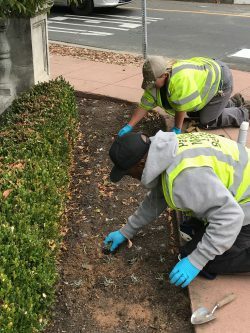 The work promises to make The Circle’s vegetation healthy and attractive for years to come. And it will make the upcoming decoration of the fountain for the holiday season even better. Thanks, as always, for your support of your volunteer neighborhood nonprofit, Friends of the Fountain and Walk. With your help, our partnership with the city ensures that this architectural landmark — the fountain, the balustrade and the adjacent Fountain Walk — gets the attention it needs to thrive for years to come.